Winter camping means one thing: more time spent around the campfire, as the weather is colder and daylight is in short supply. One way to enjoy your time spent around the campfire with friends is indulging in delicious food. 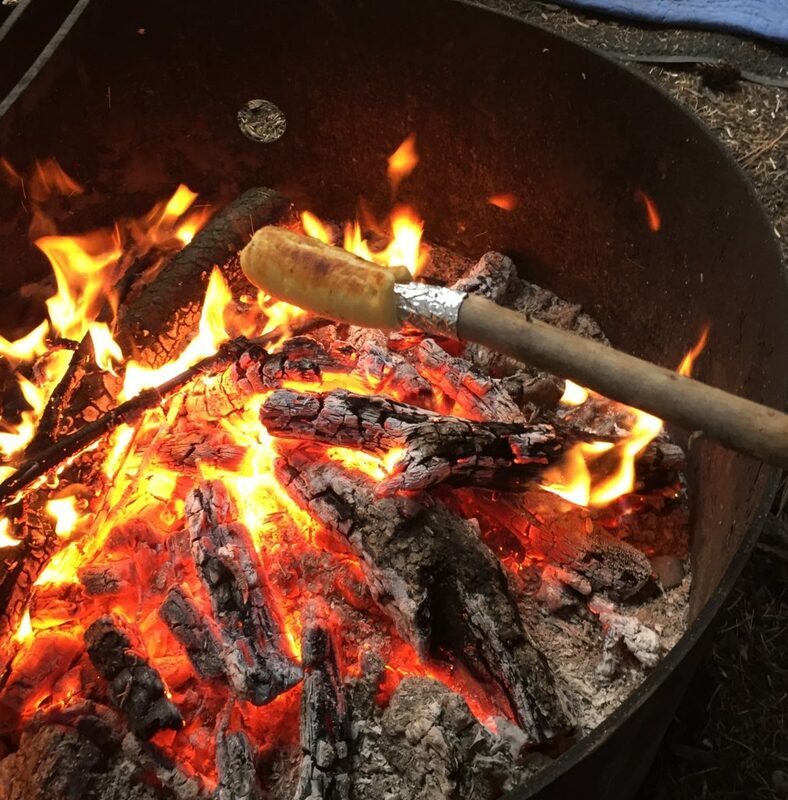 Awhile back I shared how to cook breakfast on a stick. 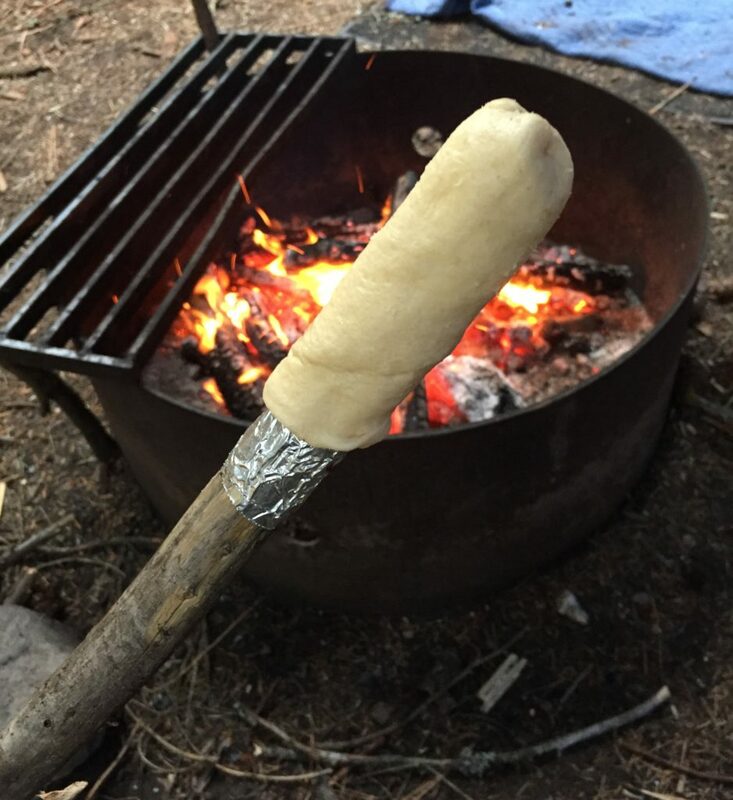 In this installment, we will look at how to cook a tasty dessert over the campfire again using a stick and I am not talking marshmallows or s’mores! 1. 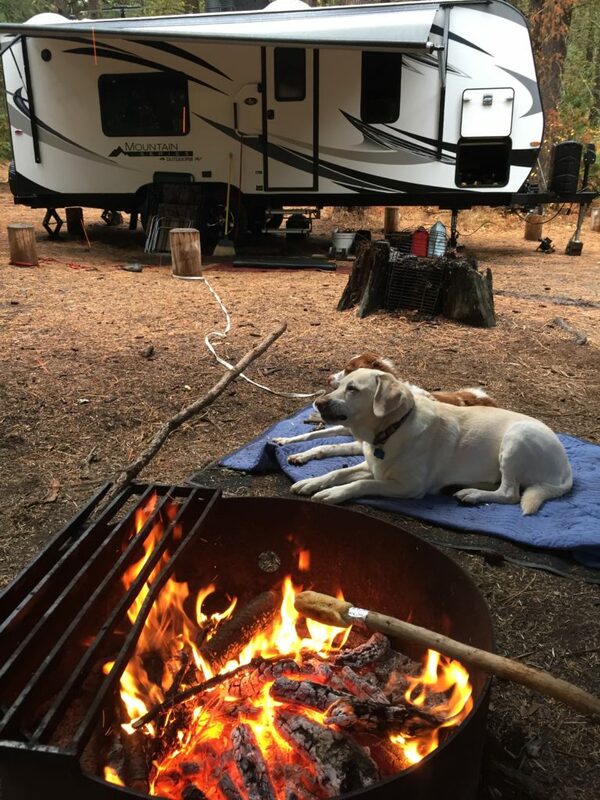 Before sitting down around the campfire, prepare some vanilla pudding either at home or in your RV. Keep it refrigerated until you are ready for use. 2. With a nice bed of coals in your campfire ring, forage around the campsite for roasting sticks that are ¾ to 1” in diameter at the roasting end. Wrap aluminum foil around the last 4 – 5” of the roasting end of the stick. 3. Coat the foil using nonstick cooking spray or butter. 4. 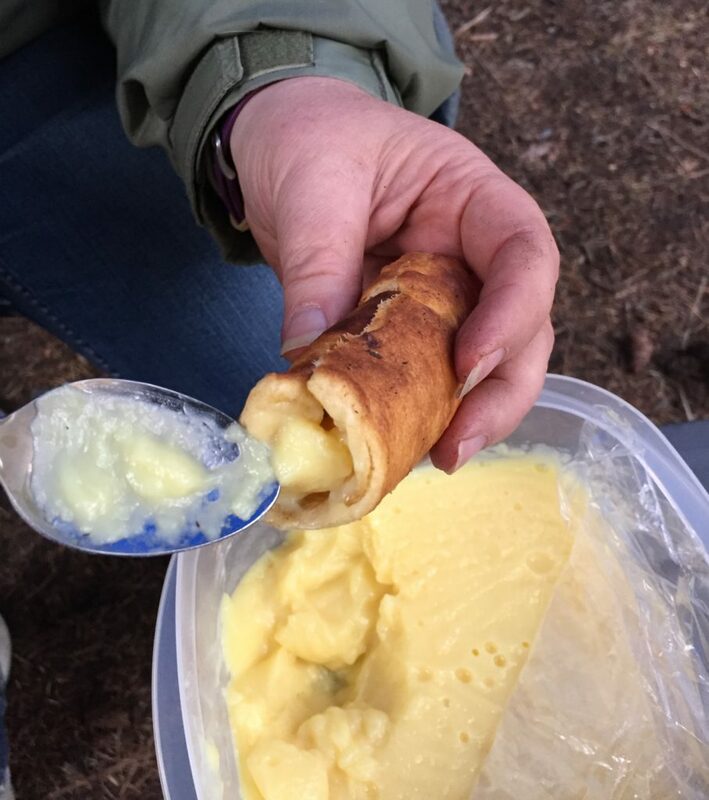 Break open a tube of refrigerated crescent rolls and wrap the dough of one roll around the foiled end of the stick, making sure to close off the end and making a good seam where the two edges meet down the side. 5. Roast the dough over the fire, rotating it in the process until all sides are a golden brown. Best results are when you keep it slightly above the flame and roast slowly. 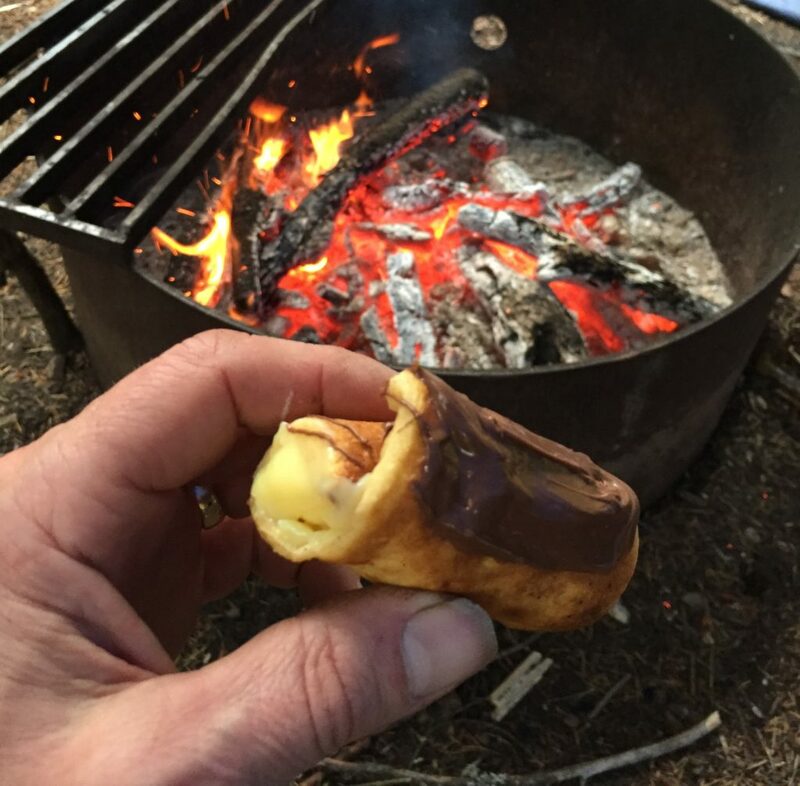 Roasting eclairs – Camping at its finest! 6. When the roll is fully cooked, gently remove it from the stick. It should easily slide off if you applied sufficient nonstick spray or butter. 7. Fill the open end of the cooked dough with pudding. 9. Enjoy and repeat until all the dough is used! Enjoying warm, quality éclairs around the campfire, just another great adventure in RVing. Sounds like a pudding filled biscuit – Yuck – Why not a proper light flaky dough? While on an Alaskan caravan with Fantasy RV Tours this past summer our tailgunner introduced to these magical treats! Fabulous!